Officers responded to the 3000 block of Cantabrian Dr., on Saturday, December 26, 2015, at 9:22 pm, after receiving 911 calls of a disturbance and shots being fired. Upon the officer’s arrival, they were informed that the armed male suspect fled into his apartment. Officers tried speak with the suspect but he barracked himself in his house and refused to come outside. The Tactical Response Unit was deployed to the scene at 9:44pm. The team attempted to negotiate with the male, advising him to surrender, however he continued to ignore their commands; therefore TRU Officers breached the apartment and made entry at 12:35am. The 25 year old, suspect was taken into custody, without incident, and transported to the Killeen City Jail. His name has been withheld pending the return of formal charges by Bell County District Attorney’s Office. Alexis Jillian Woods turned herself into the Bell County Sheriff’s Office today, December 22, 2015; she is currently in the Bell County Jail awaiting arraignment. Killeen Police Charge Drivers in the Fatality on Trimmier. Officers responded to a 911 call on Friday, November 13, 2015 at 12:13pm, telling them of a crash that occurred in the 5400 block of Trimmier. Upon the officers’ arrival they located a black Chevy Camaro in the roadway and a gray Ford Taurus flipped on its side. The female passenger of the Taurus, 66 year old Francine Winbush of Killeen, was pronounced deceased at 1:26pm by Justice of the Peace Garland Potvin and pronounced the driver, 60 year old Michael Keith Lockett of Chicago, deceased at 1:27pm. He has ordered an autopsy to be performed at the Southwest Institute of Forensic Sciences in Dallas. On Friday, December 18, 2015, this case was reviewed by the Bell County District Attorney’s Office and two complaints were returned charging 17 year old Alexis Jillian Woods and 18 year old Tyrone Floyd Moore with Racing Causing Death. Justice of the Peace Bill Cooke issued a warrant for their arrest and recommended a $1,000,000 bond. Moore has been apprehended and is currently at the Bell County Jail. Killeen Police investigate a late night fatality on College Street. Killeen Police responded to the 1000 block of College Street, at 10:10pm, on Friday, December 18, 2015, after receiving a 911 call in reference to a crash. Upon the officers’ arrival, they located a green Honda Civic had crashed into a utility pole. The preliminary investigation revealed that the 2000 Honda Civic was traveling northbound on College Street at a high rate of speed. As the driver of the Honda went through the intersection, the vehicle hit a dip, causing him to lose control of the vehicle; it turned counter clockwise and slid sideways, striking a utility pole on the westside of the roadway. The male driver was transported to the Carl R. Darnall Army Medical Center and subsequently transported to the Baylor Scott and White Hospital in critical condition. The female passenger was transported to the Carl R. Darnall Army Medical Center where she succumbed to her injuries. Justice of the Peace Bill Cooke pronounced 32 year old Analy Schlichting deceased at 11:59pm. He has ordered an autopsy to be performed at the Southwest Institute of Forensic Sciences in Dallas. The Killeen Police Department Traffic Unit continues to investigate this fatality and information will be released as it becomes available. Investigators are asking anyone if they know the whereabouts of Alexis Jillian Woods to contact Crime Stoppers at 526 – TIPS (8477), go online at www.bellcountycrimestoppers.com or text BELLCO along with their tip to 274637. Text HELP for help to 274637 or text STOP to stop the tip to 274637, message and data rates may apply. All information is confidential and you can remain anonymous. If your tip leads to the arrest of the suspect you could be eligible for a reward up to $1,000 in cash. Killeen Police investigate the death of a toddler on Castlewood Dr.
Officers responded to the 4800 block of Castlewood Dr. on Tuesday, December 15, 2015 at 5:29pm, in reference to a child not breathing. Upon the officers arrival they located a 2 year old male child who appeared to be malnourished in the living room. Justice of the Peace Bill Cooke arrived and pronounced Colt Landon Murphy deceased at 6:09pm. The father of the child was taken into custody and transported to the Killeen City Jail. An autopsy was conducted at the Southwest Institute of Forensic Sciences in Dallas and it was determined that the child was severely malnourished and dehydrated. Detectives conducted an investigation and presented this case to the Bell County District Attorney’s Office for review. 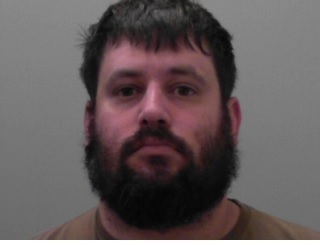 A complaint was returned charging 29 year old George Ryan Murphy with Injury to a Child with Serious Bodily Injury. Justice of the Peace Bill Cooke set his bond at $1,000,000; he has been transferred to the Bell County Jail where he remains at this time. KPD Conducts Death Investigation on Castlewood Dr.
Officers responded to a report of a child not breathing in the 4800 block of Castlewood Dr. on Tuesday, December 15, 2015 at 5:29pm. Officers arrived to the residence and located a 2 year old unconscious and unresponsive male in the living room area. Justice of the Peace Bill Cook pronounced the child deceased at 6:09pm and ordered an autopsy to be performed at the Southwest Institute of Forensic Sciences in Dallas. The cause of death will be determined once the autopsy results have been returned. Detectives continue to investigate this death and will release information as it becomes available. Killeen Police investigate a shooting on Corona Drive. Officers responded to a 911 call in reference to shots fired in the 2200 block of Corona Drive at 6:04pm on Saturday, December 12, 2015. Upon the officers’ arrival, they located an 18 year old male victim lying in the roadway suffering from a gunshot wound. The preliminary investigation revealed that a red, unknown make and model vehicle, was near the victim when gunshots were fired in front of 2202 Corona Drive. The victim, Edward Daquane Hunter, was immediately transported to the Carl R. Darnall Army Medical Center where he succumbed to his injuries and was pronounced deceased by medical authorities at 6:47pm. Detectives are continuing to investigate this Murder and are asking anyone who has information about this incident to contact Crime Stoppers at 254-526-TIPS (8477) or go online at www.bellcountycrimestoppers.com or text BELLCO along with the tip to 274637. Text HELP to 274637 for help with the tip or text STOP to 274637 to stop the tip. Message and data rates may apply. All information is anonymous and confidential; if your tip leads to the arrest of the suspect(s) involved in this case you could be eligible for a reward up to $1,000 in cash. The suspect has been identified as Francisco Luis Montanez. Justice of the Garland Potvin set his bond at $100,000; Montanez is currently in the Bell County Jail. Officers responded to the Hallmark Inn & Suites located at 4500 E. Central Texas Expressway, on Wednesday, December 9, 2015, at 8:45pm, after receiving information that person had been shot. Upon the officers arrival they located a female with a gunshot wound to the upper thigh. The officers were told there was a verbal altercation between a male and a female, at some point the male pulled out a gun and shot the female; the suspect then fled the area. The officers were given the description of the suspect and located the suspect in the area. Officers arrested a 34 year old Hispanic male and transported him to the Killeen City Jail. The 29 year old victim was transported to Baylor Scott & White Hospital where she remains in serious condition. 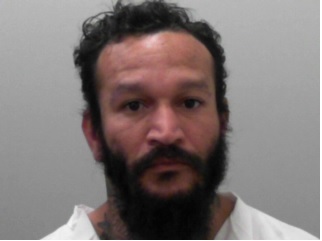 On Thursday, December 10, 2015, this case was reviewed by the Bell County District Attorney’s Office and a complaint was returned charging the suspect with Aggravated Assault with a Deadly Weapon. He is currently in the Killeen City Jail awaiting arraignment by the Justice of the Peace on Friday, December 11, 2015. The suspect’s name has been withheld until he has been arraigned. 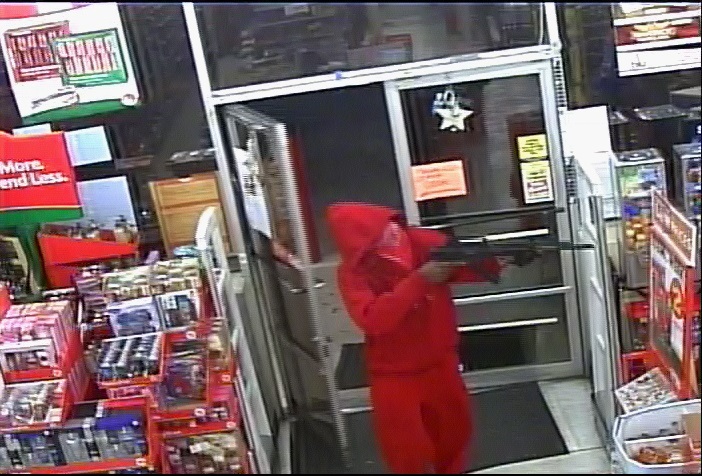 Killeen Police investigate Aggravated Robbery at Family Dollar. Officers responded to the Family Dollar located at 2304 Stan Schleuter Loop at 9:13pm, on Monday, December 7, 2015, after receiving a 911 call advising the store had just been robbed. Upon the officers’ arrival they were told an armed black male, approximately 6’0” tall, wearing a red hooded sweatshirt, red sweatpants and a red bandana, entered the store and demanded money. The officers were also told the suspect fired his weapon several times inside the store then fled the area. No one was injured during this incident. The officers searched the area but were unable to locate the suspect. Detectives are asking anyone who may have information about this Robbery or may have information about the suspect to contact Crime Stoppers at 254-526- TIPS (8477). They may also contact Crime Stoppers at www.bellcountycrimestoppers.com or text BELLCO along with their tip to 274637. Text HELP to 274637 for help with the tip or text STOP to 274637 to stop the tip, data rates may apply. All information is confidential and you will remain anonymous. If your tip leads to the arrest of the suspect you could be eligible for a reward up to $1,000 in cash.